Is the Upcoming ACSC/APF a Safe Space for Independent Lao CSOs? 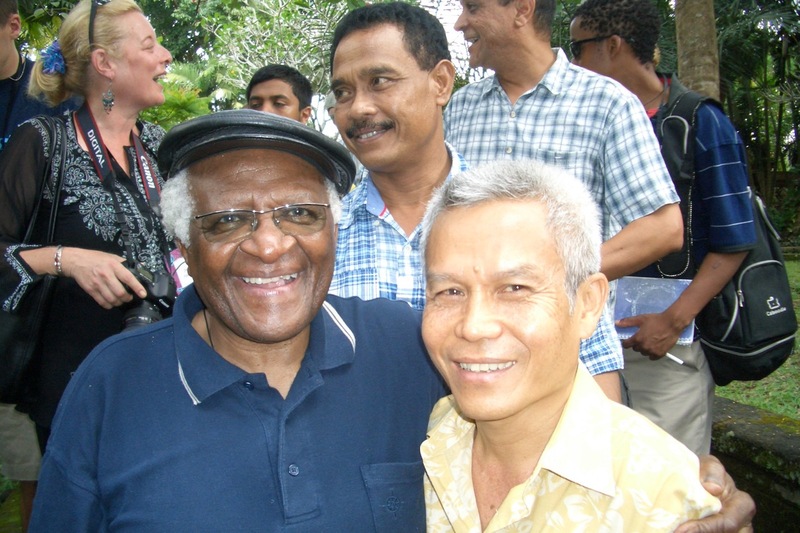 “Laos’ CSOs have lost face because of Sombath Somphone. We have lost the financial sources from donors because of him,” said Mr. Cher Her, vice chair of Laos’ ASCS/APF NOC. 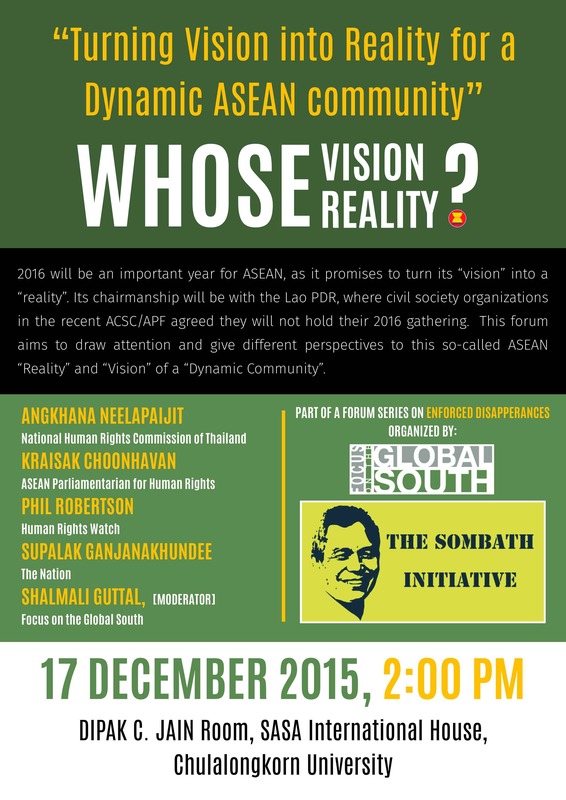 Chrek Sophea blogs on current issues confronting the ACSC/APF, reflecting on what have transpired in recent preparatory meetings and on the challenges that affect the future of this regional civil society formation, including Sombath Somphone’s enforced disappearance which continues to be a major issue. This public forum will share the key lessons and conclusions from the Sombath Symposium, a three day event which aims to exchange and explore various traditional, cultural and alternative perspectives on how humans value and interact with nature. Participants of symposium will come from Vietnam, Laos, Thailand, The Philippines, Indonesia, and India, and represent a wide range of ethnic, cultural, religious and vocational backgrounds and perspectives. The forum will also be joined by local community and activists from Thailand to contribute to the discussion on their struggles to protect the nature and livelihood. For more information about this event and to confirm attendance please contact Hamdee Tohming at [email protected] or 089-004-4117. Focus on the Global South-Philippines and Stop the War Coalition-Philippines hold a ‘lightning rally’ in front of the Lao PDR Embassy in Magallanes, Makati to mark the 2nd year since Lao civil society leader Sombath Somphone was forcibly disappeared. 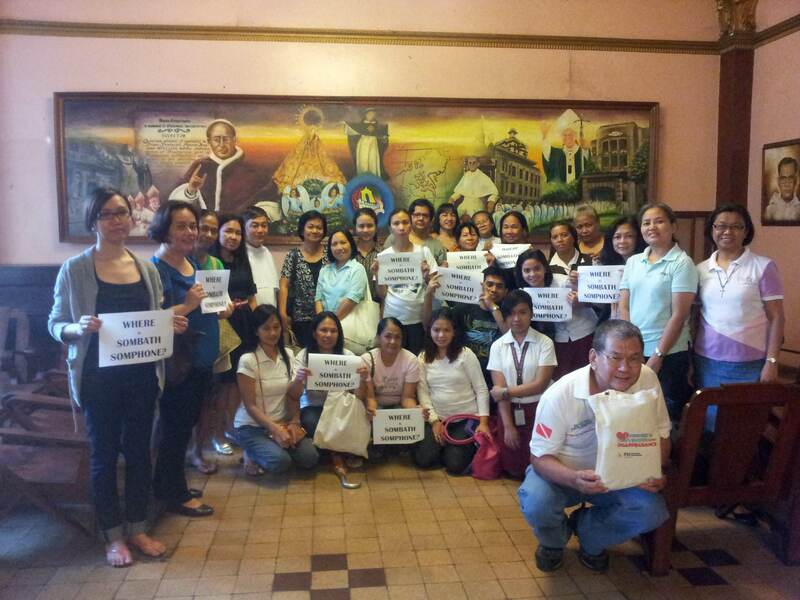 The Association of Major Religious Superiors in the Philippines’ Office of Women and Gender Concerns, together with Focus on the Global South, launched a ‘Let Us Not Forget’ campaign through a solidarity mass at the University of Santo Tomas in Manila on June 30. The Asian Federation Against Involuntary Disappearances participated in the event. 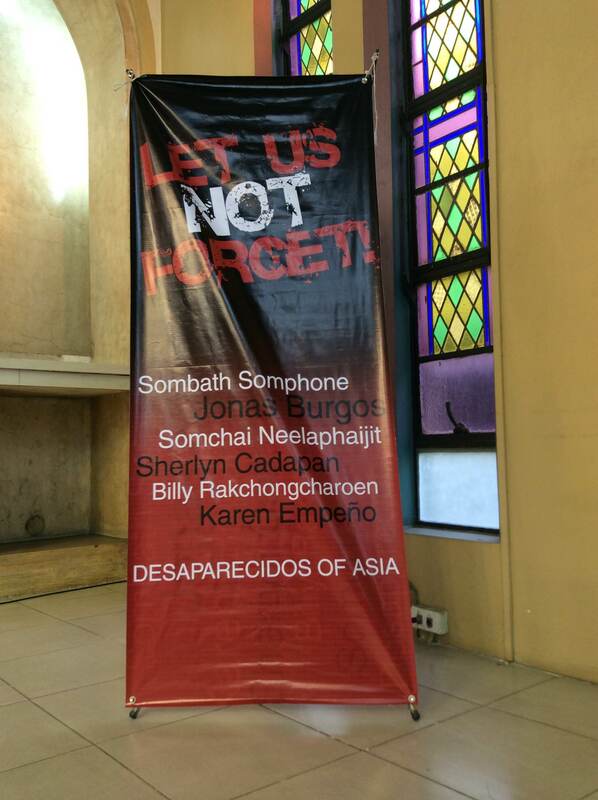 From hereon, the groups will conduct a ritual for remembering every first Saturday of the month to ensure that the campaign for the safe return of Sombath Somphone of Laos and other desaparecidos of Asia continues. In the mass, officiating Catholic priest of the UST, Father Quirico, reminded those who were gathered that “forgetting about human dignity is a social sin” that serves as “root of evil doings” such as forcibly abducting and disappearing people.